Sometimes we take things for granted, like how curtains are supposed to glide smoothly on a curtain track. They should open and close easily without a second thought. But that's not always the case. In a case like this, we always recommend double checking the track to make sure it isn't bent out of shape. A track that is bent can cause carriers to get stuck and not move easily. If that isn't the problem, we suggest checking to see if there are two tracks joined and that they are even. If the track looks good, then the carriers should be looked at. It just may be time to replace one or more of them. For these particular curtains, our 84100 and 84102 ball bearing carriers are super smooth plus they are affiordable. They are made of alloy so they resist rusting and they are 20% - 25% smaller than traditional curtain carriers. That means there is less stacking space and the curtains will open into a smaller space. So not only are they smooth, they also allow the curtains to be be pulled back further revealing a bigger view from the window. Not sure what carrier is right for your project? Our website has a wide variety of carriers, like Sew-In Button Carriers, the 7120 Curtain Track Single Snap Carrier, the 84104 Wheeled Snap Carrier, plus so many more. You are sure to find the perfect one for your project, but if you aren't 100% sure what carriers would work best, give us a call. We'd love to help. When it comes to curtain tracks, drapery hardware and accessories, we know you have a choice. But there are differences between Curtain-Tracks and other online retail stores. When it comes to quality, you won't find higher quality products on the market. Sturdy and reliable, our products can withstand a lot. But if you are not satisfied, we will accept returned products, in unused condition and in original packaging, excluding custom orders, within 45 days of purchase date. When it comes to customer service, you won't experience working with a better team than the experts at Curtain-Tracks. The goal of the team at Curtain-Tracks.com has been to provide the best drapery hardware solutions to our customers in combination with extremely competitive pricing on our products. Unlike many online stores that do not have a customer service department, our customer service team will help you (if you need them to) select the best products. They will also make sure you don't forget a critical part (like end stops) and will walk you through your project from start to finish. And if you need a particular product that you don’t see listed on our site, let us know and we can probably locate it for you. We offer phone support Monday-Friday from 8 AM to 12 AM and Saturday-Sunday from 9 AM to 9 PM Eastern time. Curtain-Tracks was founded in 2007 is a WBENC certified woman-owned business, and we have an A+ rating with the Better Business Bureau. We are proud to be the experts and would be honored to have you as our customer. We know you have many choices in where you chose to shop, and appreciate your business. Give us a call – we are here to help! 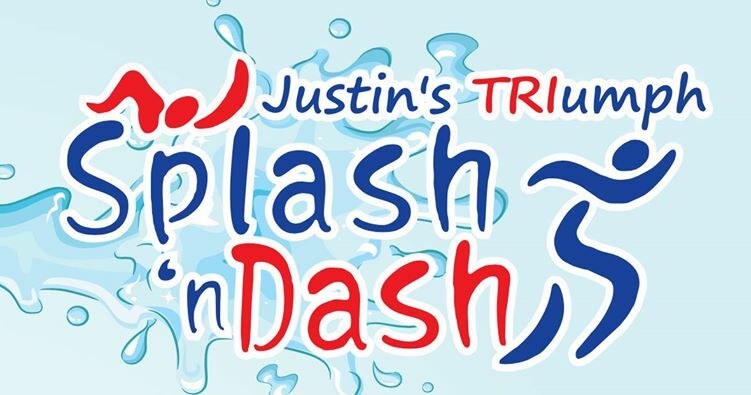 Curtain-Tracks.com is proud to continue its support of the Annual Splash-N-Dash put on by Justin's TRIumph over GAN. This year's fundraising race will be held on Sunday May 6th, at the JCC of Houston. 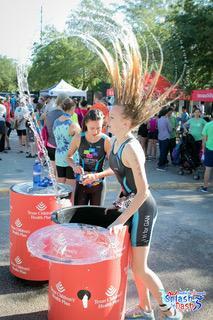 The race begins at 8 am and all kids aged 7-15 are eligible to race. Volunteers are also always needed for set up, race management, and clean up afterwards. It is a terrific event. Click here to register. Justin's TRIumph has a mission, in partnership with Hannah’s Hope Fund for Giant Axonal Neuropathy, Inc., to help raise funds to support the development of a treatment and cure for GAN disease, and to be the resource for doctors, scientists and families world-wide. Justin Clark, along with his sister Lexi Clark, both suffer from this rare disease. Curtain-Tracks.com is supporting the efforts to find a cure in time to help both these terrific kids, along with the others who suffer from this deadly disease. P.S. What a great event it turned out to be! 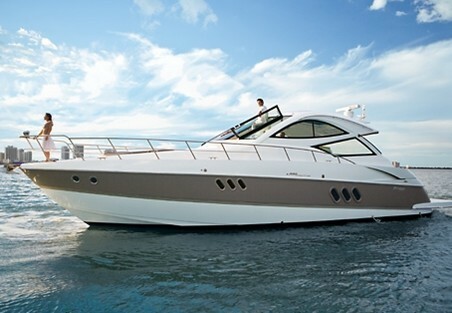 Summer is right around the corner and with that comes boating season. For boat owners everywhere, taking your boat of storage is filled with excitement and anticipation. Excitement for the many hours to be enjoyed on the water and anticipation of how the interior looks after a long winter in storage. If your anticipation turns to sadness because you notice there needs to be some updating or replacing of curtains in the interior of your boat, turn that frown upside down because Curtain-Tracks is here to help! No matter the weather, we have the best selection of tracks and boat curtains around. In fact, we can custom make your curtains to your exact specifications. From our experience, no two boat windows are exactly the same, and because of this, you can’t just shop around for boat curtains that will fit just right. Boats aren’t perfectly symmetrical, so we recommend carefully measuring every job. Our boat curtain fabrics are durable, flame retardant, and Safe-T-Stitching locks in hems and seams. Not only are they high quality, they are available in a variety of colors. We’ve also got liners and blackout fabrics. Choose your fabric and then we highly recommend installing your boat curtains with snap tape. 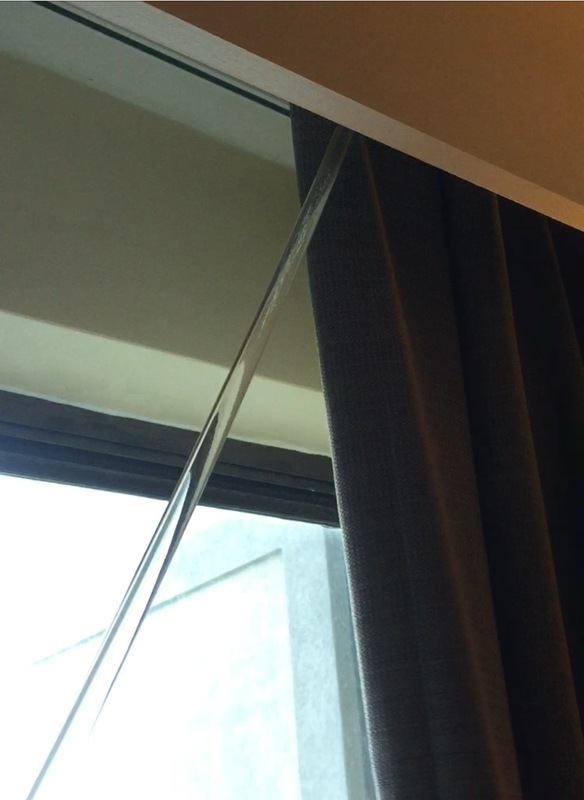 Snap tape affixes the curtain to the track via snaps that quickly and easily release the curtain panel when roughly pulled. Snap tape allows you to easily change the décor, keeps your curtains from ripping and your tracks from being damaged if a passenger aggressively grabs the curtain quickly due to rough seas. Now that you have your curtains, if you find you need new curtain tracks, we suggest one of the most useful tracks for boats, the CurtainMate curtain track, This track is often used in boats and RVs. It is a small track that keeps a low profile, can be bent by hand, and is easy to install. It’s available in White, Brown, Gray, Black, Tan, Dark Desert, and Dark Slate so you can choose the color that best compliments the interior of your boat. Ready to spruce up your boat for the season? Give us a call at 888-434-7444, and we will help you every step of the wa including custom making your curtains! Older homes often have a lot of character, like arched entryways, beautiful crown molding, cozy little nooks and sometimes even odd angles. The uniqueness of each older home sometimes poses a decorating challenge, especially when walls aren’t completely symmetrical. When it comes to window treatments, of course we always prefer using curtain tracks over rods, but especially in a home that may have a sloped ceiling; a curtain track will always win. Don’t be intimidated by the unevenness of a sloped ceiling. Ceiling-mounted curtain tracks offer a solution. You can install the track directly into the slope of the ceiling but then you need to decide about the curtain panel. You can leave it in a rectangular shape and have the bottom hem follow the angle of the ceiling or you can purchase or make a very long panel and cut it so that it fits the space provided. Either is acceptable, but the first has a bit more of a drawback. Transforming your rectangular curtain into a parallelogram is easy, but will leave an opening near the floor and increase the perception that the room is off kilter. The second option of trimming a corner of a long curtain to fit the space will create a dramatic look, but opening the panel becomes tricky as the longer side of the panel will pool on the floor when moved to the shorter part of the ceiling-which isn’t necessarily bad from a designer standpoint as curtains that pool slightly on the floor are all the rage in the decorator world. There is an option 3. Hanging our 88001 Privacy Cubicle Track offers another option. Suspend the track to make it level. 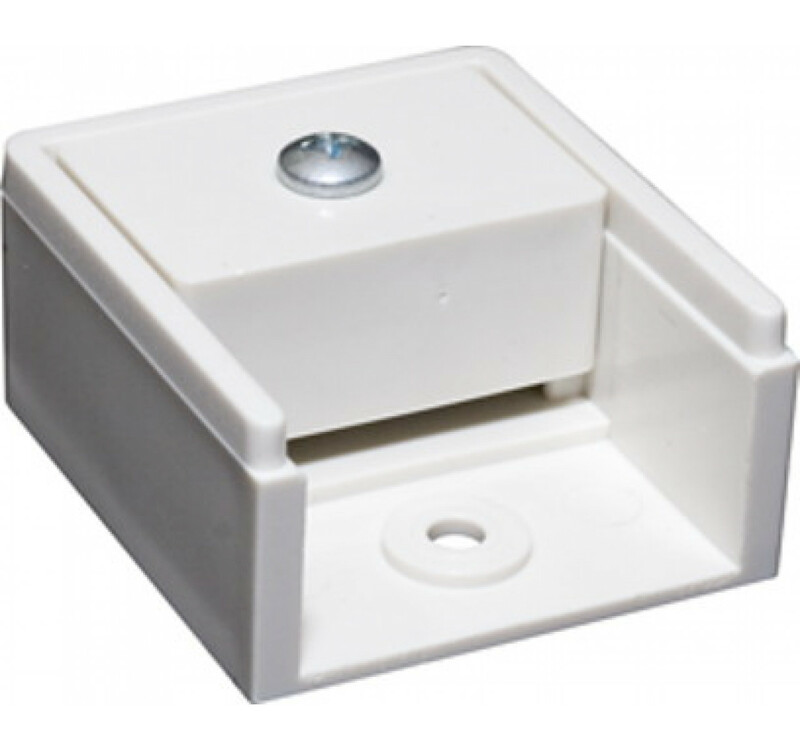 Our suspension parts, compatible with 88001, will allow you to install the track on a sloped ceiling using suspension tubing. Simply cut the tubing to length, and attach one end to the ceiling with the 88204 Ceiling Flange, and connect the other end of the tubing to the track with the 88202 Track Adapters. The tubing is attached by drilling a hole to allow the mounting bolt to pass through the tubing. You will see this method in retail stores, lofts and other establishments where there are extremely high ceilings. Nervous? Don't be! Give us a call at 888-434-7444 and we will be happy to assist you. We admit it. We look for curtain tracks everywhere we go, especially when we stay in hotels. 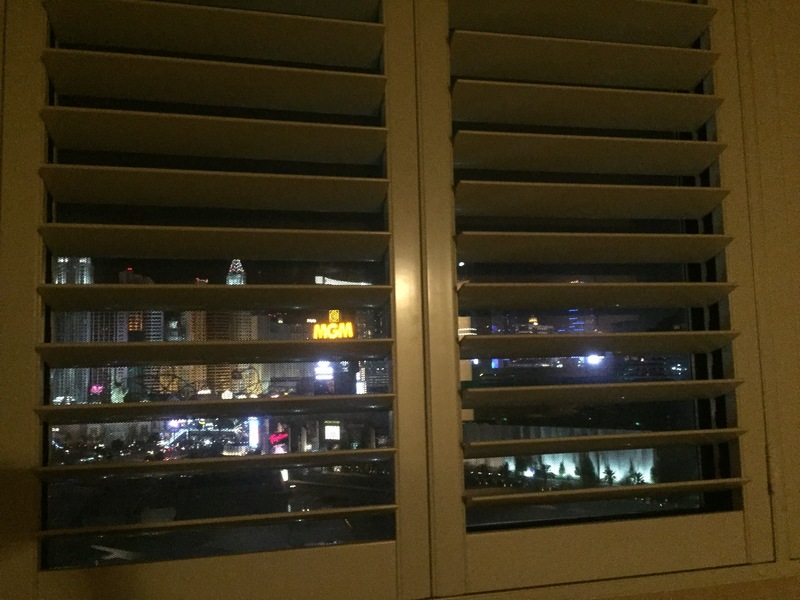 On a recent visit to Las Vegas, a team member stayed in a hotel that was located right on the strip. The flashing lights and sounds are 24 hours a day because, you know, it's the city that never sleeps. Well, our team member happens to enjoy sleep and was sorely disappointed when she discovered the room she was staying in did not have curtains (let alone curtain tracks). This hotel instead chose to use plantation shutters on every window. While shutters LOOK nice, they aren't the most effective when it comes to blocking out light or sound. Perhaps in Vegas, that's the whole idea... they'd rather you DIDN'T sleep. For a solid night's sleep, we always recommend using eclipse curtains, also known as black out curtains. They block 98% of light and are sound absorbing. They are extremely effective in creating a darkened, quieter room when installed using a ceiling mount curtain track, as they cover the entire window. Many hotels (but not this particular one in Las Vegas) use eclipse curtains and ceiling mount curtain tracks because they want their guests to get a good night's sleep. For this very reason, we hear from customers who want to replicate this look for their very own home. If you are interested in creating a dark, quiet sanctuary in your bedroom, our eclipse light blocking curtains will certainly help. These curtains are custom made to your exact specifications so you can be sure they are perfect for your project. Contact us and we can walk you through your project. In the meantime, if you visit Las Vegas, we recommend a sleep mask and earplugs if you want to actually sleep. In our blog, we've written a few posts about using curtain tracks for claw foot tubs. Claw foot tubs often need a curtain track to encircle the entire tub when they are placed away from the wall, allowing for privacy from all angles. 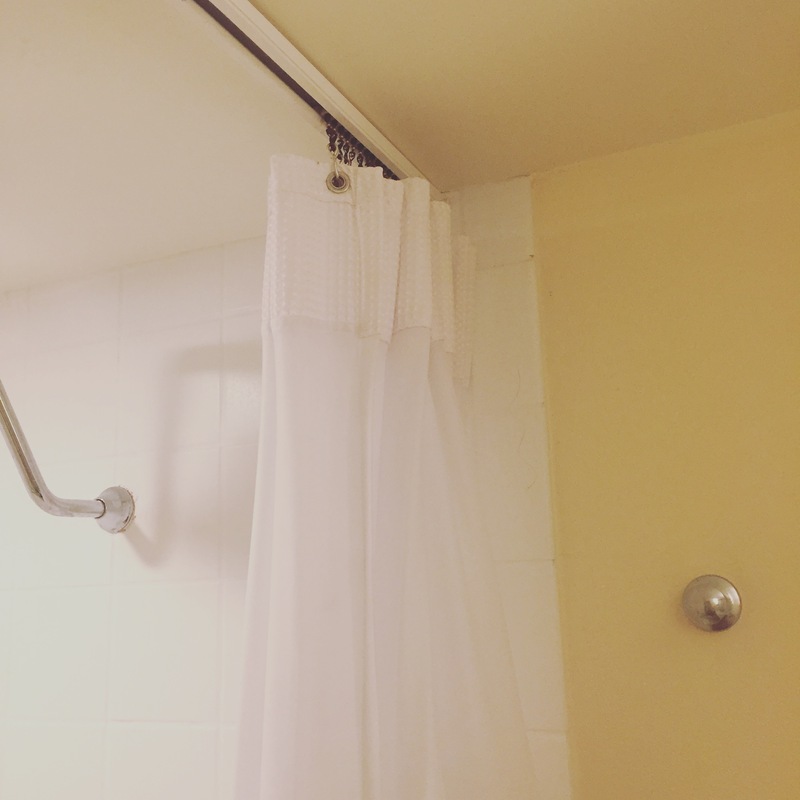 In this blog post, we want to address using curtain tracks for a soaker tub/shower combo and how we recently helped a customer who had a triangular shaped soaker tub in the corner of the bathroom that doubles as a shower. Enjoying a long, luxurious bath in a soaker tub sounds amazing but if that tub doubles as a shower, you need to think of a way to enclose the tub. Since our customer has a tub in the corner of the bathroom, she wanted to add a ceiling track that could accommodate the curved angle around the edge of the tub which would keep the water inside the tub when the shower is in use. We recommended our 6100 flexible curtain track. This track is simply the best. It can be bent to fit almost any angle (and certainly the curved angle of her tub) and you don't need tools as it can easily be bent by hand. Simply mount the track on the ceiling, add carriers, hooks and a shower curtain and your tub/shower combo is ready to go. If our customer wants to feature the tub, she can keep the shower curtain pulled back to one side or pull it closed to conceal the tub/shower. A project like this is easy to complete and we are always happy to help solve a decorating/functionality dilemma. Interested in reading more about customer bathroom projects? Visit our blog under our bathroom category to get ideas or contact us and let us know how we can help you with your next project. When anyone ends up in the hospital, they want to have confidence in their doctors, nurses, staff and the facility where these professionals work. The reality with hospital rooms is that they see heavy traffic and endure a lot of use and abuse. 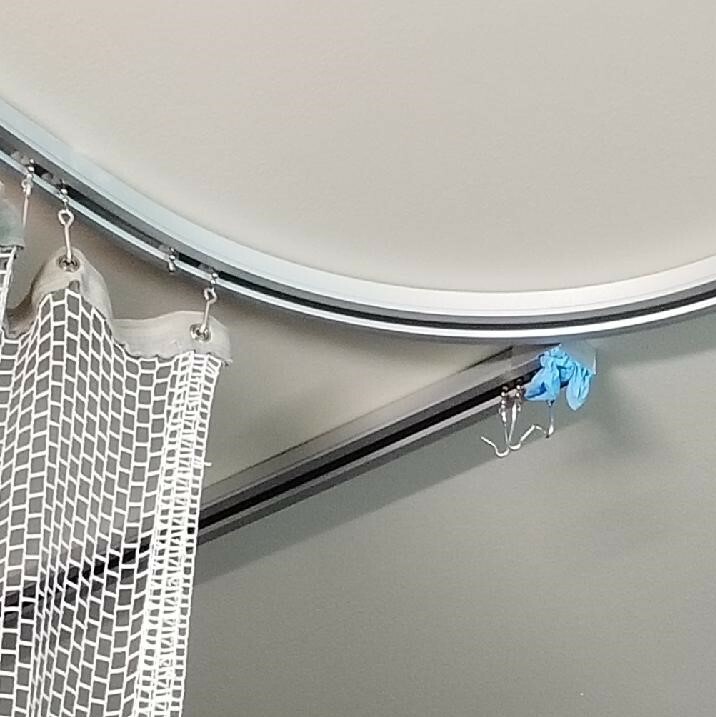 Sometimes it’s the little things that patients may notice about their hospital room, and below we cite the perfect example. Sure, we applaud the ingenuity of the person that stuffed a rubber glove into the end of the track to keep the carriers from falling out. However, replacing the end stop is a quick and inexpensive fix and it would go great lengths to improve the appearance of the hospital room and help to inspire that confidence all patients seek. Curtain-Tracks.com offers two Privacy Cubicle Track End Stops that would do the job in this particular case, and it’s only a $2 fix! 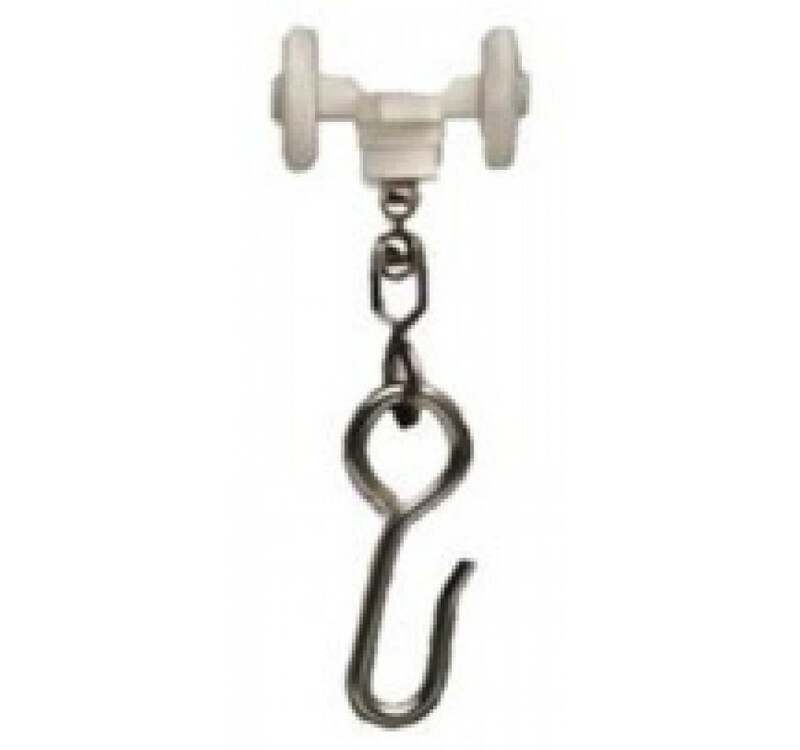 While they are at it, it looks like the hooks on their carries are bent and could stand to be replaced. Some may be missing since the end stop failed. Curtain-Tracks.com has got them covered there as well with several hospital track carriers available including what is shown in the picture above. 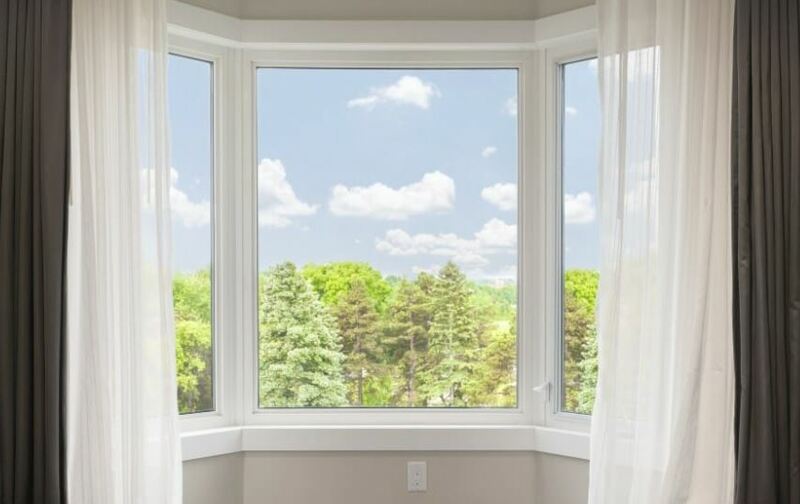 New windows not only look fantastic, they also add value to a home. There are many styles to choose from including double hung, casement, awning, picture, and one of our personal favorites, the bay window. Bay windows provide more interior space because they protrude out from the house. Oftentimes, they are a combination of windows such as a stationary window with double hung windows on the sides. The most common inside angles are 90, 135 and 150 degrees, though you can find triangular bay windows of two windows set at 120 degrees. A bay window is gorgeous, especially when it has some window accessories, such as sheers or curtains. We often speak with customers about ways to add curtain tracks and curtains to a bay window. It’s quite simple really: use our 6100 Flexible Curtain Track. This incredibly versatile track is sold by the foot and it allows long continuous lengths for curved or angled applications, but can also be used for straight applications. Made of white PVC with an internal metal spine, it can be installed on a ceiling or wall. It can be bent by hand without compromising strength and is perfect for use on bay windows. The 6100 Flexible Curtain Track is our most popular track for good reason. Not only is it inexpensive, but because it can be bent by hand, it allows you to have complete control of the track location as well as manage the angles. That means that no matter the size or style of your beautiful bay window, this track is the best choice when it comes to hanging curtains. Wikipedia says a great room is, “a room inside a house that combines the roles of several more traditional rooms (e.g. the family room, the living room, the study, etc.) into one space. Great rooms typically have raised ceilings, and are usually placed at or near the center of the home.” A feature that is often found in a great room are tall, two-story windows. 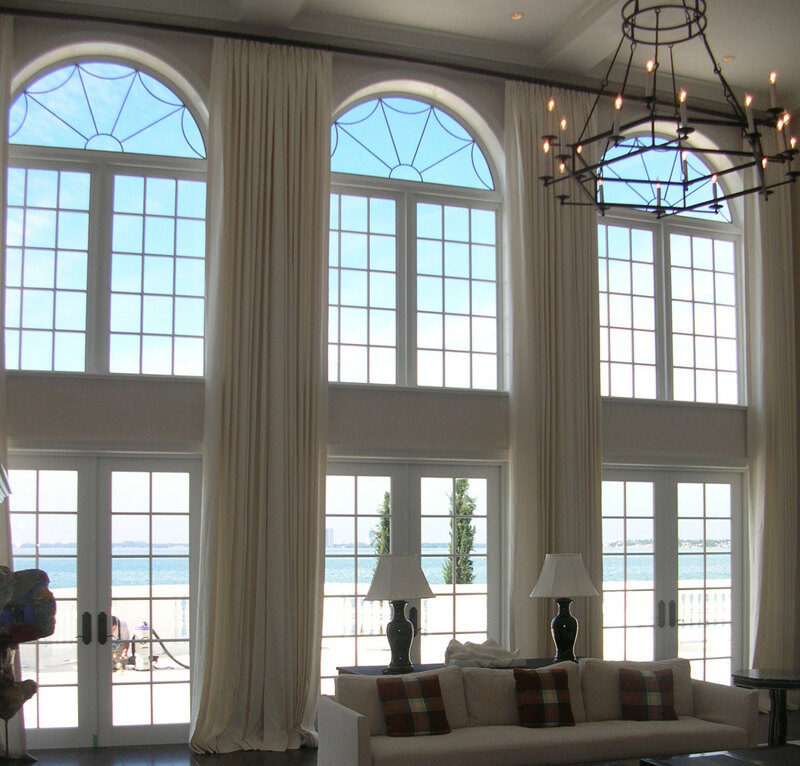 These grand windows are a focal point allowing in plenty of light. The tricky part about these windows (aside from the difficulty of cleaning them) is deciding how to “dress” them. Adding curtains or sheers is indeed possible and they look fantastic once they are completely installed. This is when we strongly suggest you use a curtain track over a traditional curtain rod. The right curtain track can bear the weight of heavy curtains, and they will be heavy, because that’s a lot of fabric. This also means a sturdy curtain track will support the constant opening and closing of the curtains. If you plan on hanging long drapes, we recommend our 6200 Heavy Duty I-Beam Track. 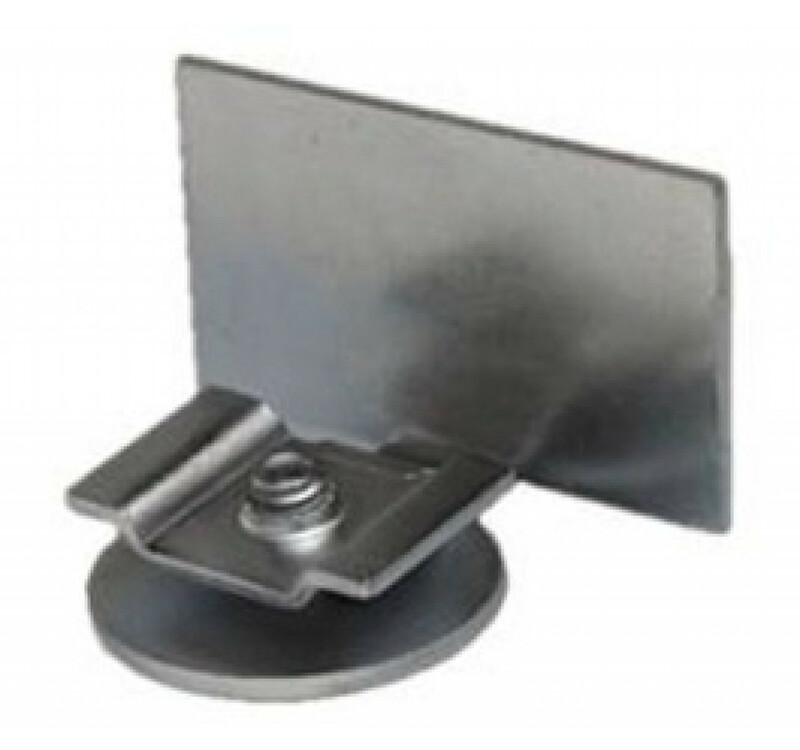 This track can be mounted on the wall or ceiling with brackets, and uses a metal block carrier with nylon wheels. 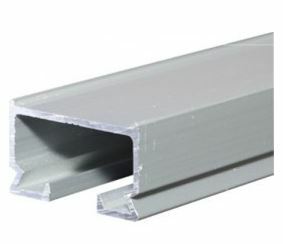 If you have really, really heavy curtain panels, we suggest our 3120 Extra Heavy Duty Track. It can be drilled directly into the ceiling with no brackets and uses large double-wheeled carriers. The type of curtain panel you choose will determine the best hooks for your project. If your curtains have grommets, our inexpensive steel curtain hooks will work well, but if the curtain panel has pleats, our equally inexpensive drapery hooks are a perfect fit. Now that you have decided to add curtains to your stunning tall windows, you will need a tall ladder, possibly some scaffolding, to get the job done. If this seems daunting, you can call a local handyman who has the proper equipment. Don’t be intimidated, instead, be excited! Your great room will look grand with your sturdy curtain tracks and beautiful curtains! Give us a call if we can help, at 888-434-7444.